Style shoots and magazine features are always fun! Here's a glimpse at the magazines and blogs that have published my work. Head on over to to the Real Weddings section to see which of my fabulous couples have been featured in print and online! I was thrilled to be asked to contribute an article to Jodi Bridal Magazine's Ultimate Wedding Guide on bespoke wedding invitations and what sets them apart from big box retailers and DIY projects. This issue is available at all major bookstores around Toronto. It's not often a designer gets to indulge their sensibilities completely, but then, that is is why editorials and inspiration shoots are such fun. 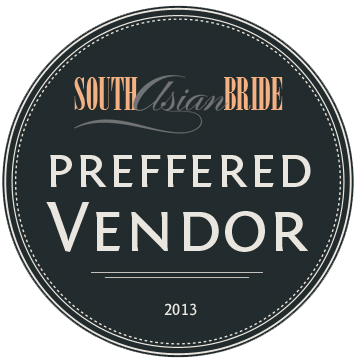 This time around, I did everything I would have wanted for myself if I was a Hampton' bride. This suite was letterpressed- once blind, and then again with navy blue ink on top. The custom seahorse monogram reflected the casual nature of the wedding and was a subtle hint at the lakeside setting. The invitation and RSVP card were designed to slide into a custom hardcover pocket folder, wrapped in a patterned paper and finished with a gold foil monogram stamp plus a navy blue silk ribbon. Matching navy blue envelopes were also stamped with the gold foil monogram and lined in handmade silk paper in navy and gold. I also designed a printed fabric "Welcome to Our Happily Ever After" banner for the reception area, along with a custom designed table runner. Both featured the monogram and the same pattern found on the invitation suite. The table setting pieces were finished off with a menu wrap and matching place cards. I received an email from the lovely assistant editor at Weddingbells asking me to create a custom wedding sparkler holder for their Spring/Summer 2013 issue. I based the design off my Ready to Wed "Everything's Coming Up Roses" line, and changed the colour to burnt sienna, accented with ivory and chocolate brown to reflect the colour feature in the magazine. These were then laser cut into a lovely shape with appropriate slits for the gold sparklers to slide through. 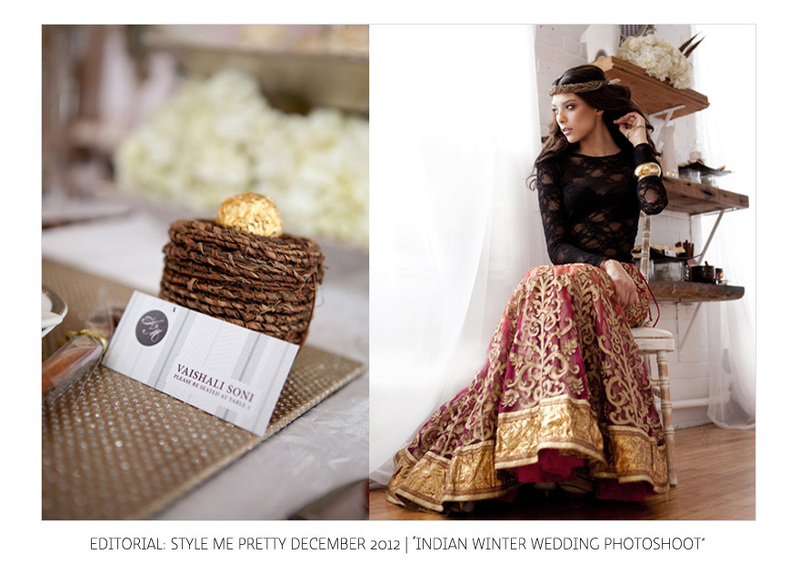 This exotic and wildly colourful Moroccan-inspired bridal fashion shoot needed an equally impressive stationery suite. The main piece was laser cut and etched out of walnut wood veneer using a geometric/Islamic art pattern as it's main influence. The accompanying pieces were designed in the very vibrant colour palette with the same pattern, and flat printed on double thick cover stock. Lastly, the place cards and gold RSVP envelope were calligraphed to finish off the look. This gorgeous shoots ranks as one of my most favourite collaborations ever! The entire look is glamorous, upscale, sophisticated and oh-so-chic. The inspiration for this shoot came from an iconic Hermés scarf print. I decided to keep the stationery clean and minimalist using shades of grey and a rich espresso colour against lots of white. I love the way those minimal colours play off against all of the textures involved in the shoot - from the luxurious (faux!) fur to the architectural qualities of the pine cones to the silkiness of the pheasant feathers, not to mention the pops of fuchsia and red on the table. The clothing, jewellery and makeup were perfectly set up, and I love the play off the tradtional and ornate Indian lehenga against a modern crop top and a sleek beehive. Bellissimo! 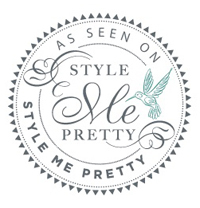 Be sure to check out the full gallery of images over on Style Me Pretty. This South Indian inspiration shoot, Midnight Rangoli, had one directive: colour, colour, colour! Rangoli patterns were a natural fit given their cultural significance and how beautiful they are. In a word, Ridaa & Hamaad's wedding was gorgeous. It was opulent and decadent with lots of rich colours and beautiful, luxurious details. Click here to see more at Grace Ormonde New England Wedding Style.